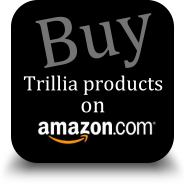 10 Things You Need To Know About Best Essential Oil Diffuser / Comparison and Review-ARTICLE | Trillia Health & Beauty Biological Technology Co., Ltd.
1. Before choosing a right diffuser for essential oils, you should identify your purpose first. 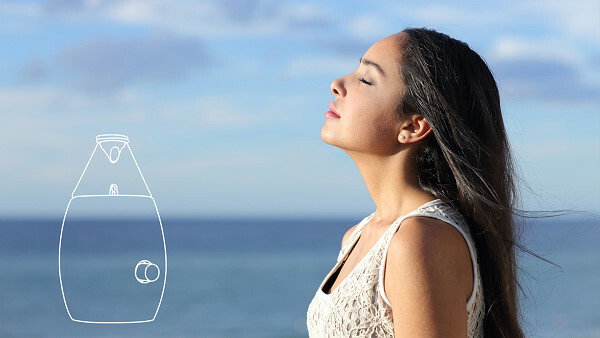 If you plan to have a diffuser to make the dry air humid and comes with slight scent of essential oils, you should choose an ultrasonic or humidifying type diffuser. If you are looking for a diffuser that can bring you the pure, strong scent of essential oils and also comes with the benefit of healing in motions or psychotherapy, you should select the nebulizer type diffuser. If you targets on medical purpose, you should directly choose the nebulizer or atomizer that medically certified by governments or related medical associations, such as U.S. FDA. 2. How to use essential oils on diffusers ? For ultrasonic or humidifying type diffuser, you should add water into tank first and then pour few drops of essential oil into water. How strong smell you will feel depends on how many drop of oil you poured. Conversely, there is no need for water if you use nebulizer type diffuser. You just pour essential oil into glass nebulizer and that’s all. 3. How does the essential oil diffusers work ? 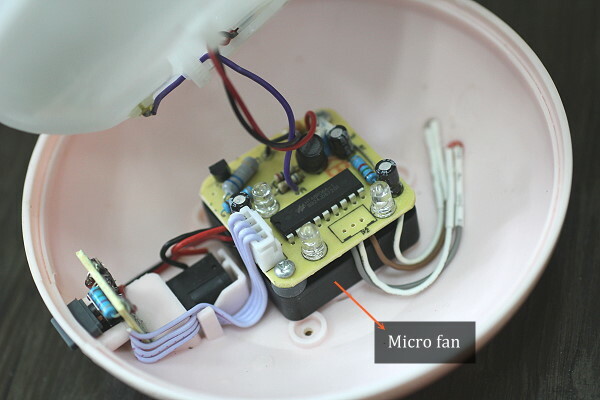 An ultrasonic or humidifying type diffuser utilizes electronic frequencies to cause a small ultrasonic ceramic vibration plate under the liquid (such as water) to vibrate in high frequency and breaks the liquid into micro particles. The nebulizer type diffuser utilizes an air pump to deliver compressed air through air pump tube to nozzle tube. A jet of air blows across the nozzle tube and creates a vacuum that pulls essential oil from the bottom of essential feed tube to the top of the tube. The air flow blows across the surface of the oil at the top of the essential oil feed tube, brings and leads the oil striking toward the inner surface of glass nebulizer. In fact, the ultrasonic ceramic vibration plate is hard to break oil. You may try to only pour essential oil into tank, no any water, or pour both essential oil and water with the ratio of 1:1, and you will find the plate doesn’t work anymore. When you pour essential oil into the tank of diffuser, the oil and water do not mix because of different proportion and type they performed. So you will see two separated layers, and the oil layer will be still there floating over the water layer, even after vibrating. The light scent you smelled when diffuser operates is mainly caused by two phenomenon, one is the result of atomizing the water with scent moistened, instead of the direct atomizing of essential oil. The other is the evaporation of essential oil or scent-moistened water. When the ultrasonic ceramic vibration plate vibrates, it will produce heat over 100℃, and this will cause some of essential oil or scent-moistened water evaporated. 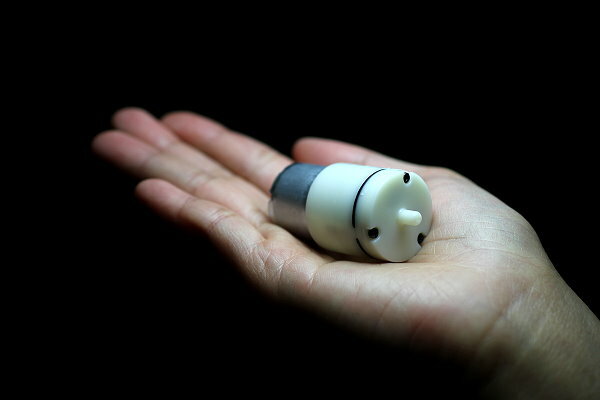 Unlike ultrasonic or humidifying type, nebulizer type diffuser utilizes the constant compressed air to drive and break essential oil into micro particles directly when the oil come out from the spray hole, so it is capable to atomize a large amount of essential oil into the air and make the air of space saturated with strong and concentrated scent quickly. 5. How much space that you can use diffusers for ? If you are satisfied with light scent of essential oil, the ultrasonic or humidifying type diffuser still can be applicable to the space of 110~150 square feet, but if you are a medium or heavy-scent oriented user, they are only proper to be used for the space between 40~100 square feet. With the powerful capacity of essential oil nebulization and air saturation, the nebulizer type diffuser is usually capable to be used for the space between 200~400 square feet, even larger space. Ultrasonic or humidifying type diffuser is good for water atomization, and most of them also equip a micro fan inside to blow out the fog, so it makes you can have a fantastic mist show when you use them. 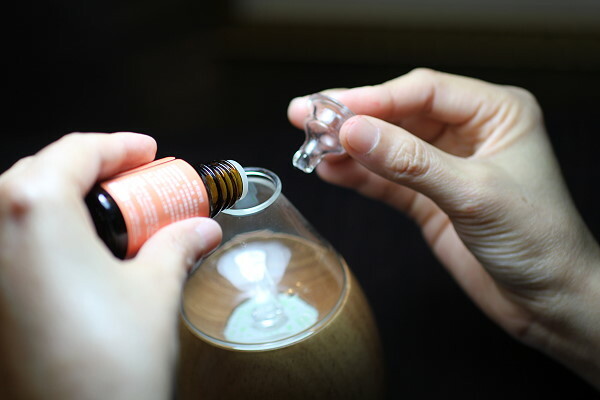 The proportion of essential oil is higher than water, so it makes nebulizing type diffuser only create limited mist, and you need to cover a glass lid with a tiny air vent when diffuser running, this also repress the mist output obviously. The purpose of glass lid is to reduce the noise of air jet and also comes with the benefit of oil saving. In general, you may hear wave noise of water and fan noise from ultrasonic and humidifying type diffuser. 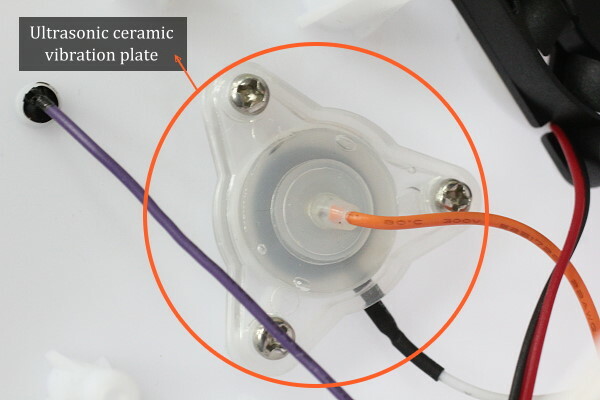 When the ultrasonic ceramic vibration plate vibrates, it will cause water oscillated with wave noise. 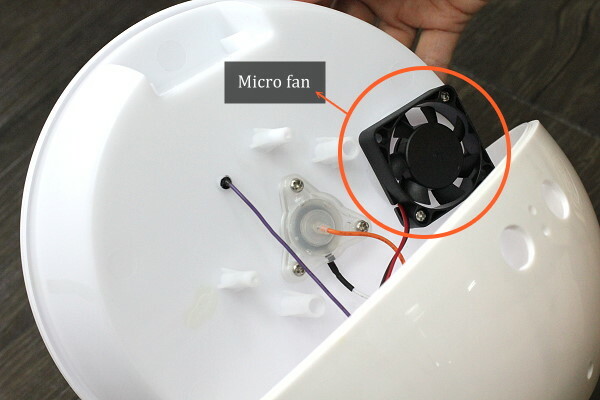 And the noise level of fan depends on the quality of fan and capability of mechanical design. 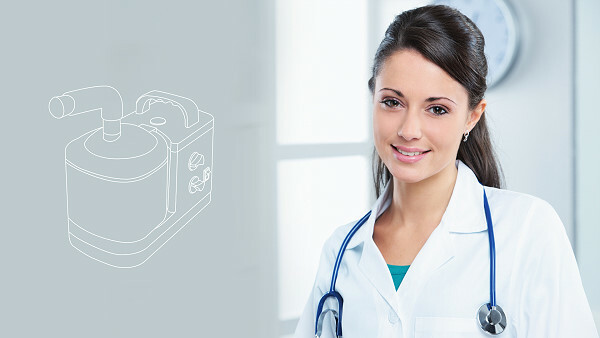 For nebulizer type diffuser, there are air jet noise and air pump noise that you may feel. Air jet noise is the result of oil atomization. 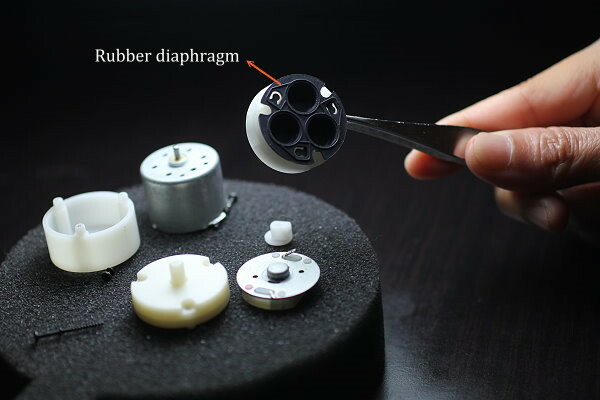 The air pump operates via a motor that causes a rubber diaphragm to oscillate at high speed, producing a steady stream of air. 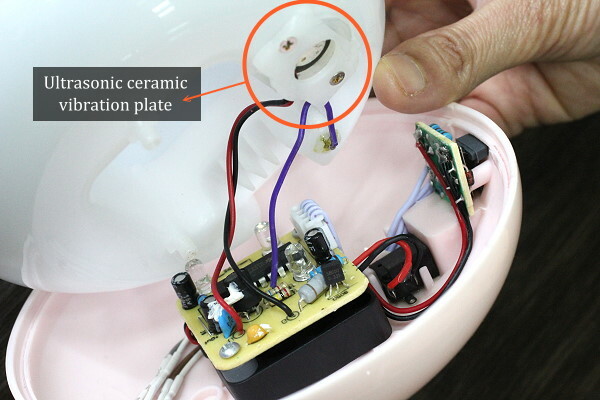 Vibrations will be transferred throughout the pump when the diaphragm oscillated. And noise level of air pump often relates to the quality of pump and capability of mechanical design. 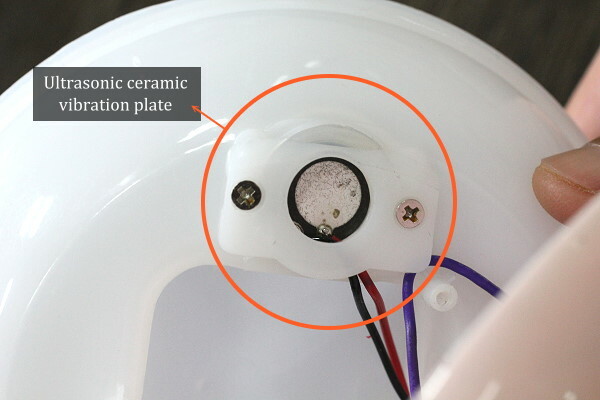 For ultrasonic or humidifying type diffuser, essential oils may lead to the ultrasonic ceramic vibration plate clogged and broken, then you need to return diffuser to seller for repair. So it is better for you to rinse your diffuser every time after using it. The nozzle of essential oil feed tube of nebulizing diffuser may clog if you use some sorts of heavy and thick essential oil, such as Sandalwood, Chinese fir, Cypress, Benzoin, and Myrrh, Or any ordinary essential oil but used for long time already. You can use medicinal alcohol to clean the clog by yourself with easy procedure. 9. Never use an undiluted essential oil on a baby or child. 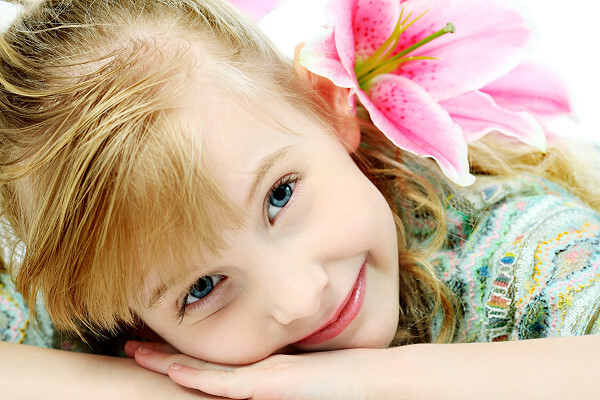 Children have much thinner, delicate and sensitive skin than adults, and tend to be very sensitive to the potency of essential oils. So it is better for you to get professional advice from expert or doctor before using the essential oils on a baby or child. In fact, most of essential oils are corrosive, so you should avoid making essential oil to have direct contact with skin, human body or swallowing it.